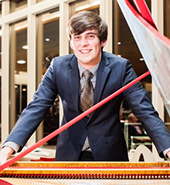 Christopher D. Lewis is a contemporary harpsichordist and a Naxos Records recording artist. His fascination with the instrument began at a young age, and since then he has made it his mission to bring the modern harpsichord and the music written for it to a global audience, intent on sharing its beauty and versatility far and wide. He has recently completed an Arts and Humanities Research Council funded PhD focused on the modern British harpsichord, and he is already internationally known as an authority on harpsichord in both classical contemporary music and in popular culture. He performs internationally, and has toured all over the United Kingdom, Canada, the United States, the Netherlands and the South Pacific. He works as a university lecturer and was recently appointed an Honorary Fellow of The Guild of Musicians and Singers.